Base map showing the territorial waters of the STP-EEZ together with neighbouring countries. The PGS MultiClient seismic and well datasets are shown together with annotations showing the major fluvial input points (orange arrows). In recent years, the São Tomé and Príncipe Exclusive Economic Zone (STP-EEZ) has been the subject of significant attention from major oil companies, resulting in applications for exploration licences and farm-in activities over nine blocks. PGS reprocessed its MultiClient library data using modern processing techniques and conducted a basin analysis study to help understand the recent interest. The study shows that all the elements of a working petroleum system are present in the waters of the STP-EEZ. Continental and transitional crust provide structures and source rocks and PGS basin modelling reveals that these sediments are mature for oil and gas. Long-lived fluvial systems provide quality reservoirs fed from numerous sedimentary catchment areas. 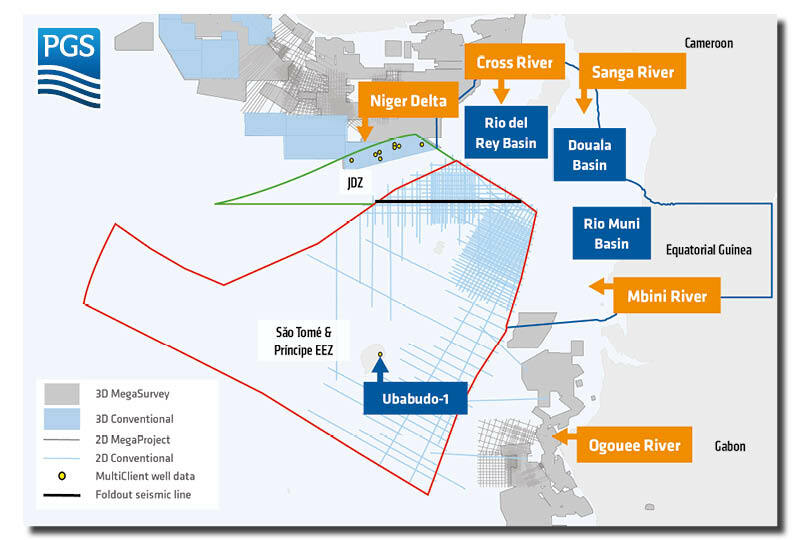 The São Tomé and Príncipe Exclusive Economic Zone (STP-EEZ) lies within the heart of a tripartite petroleum neighbourhood dominated by long-lived fluvial sedimentary basins: the Niger Delta to the north, the Rio del Rey and Douala Basins to the north-east and the Rio Muni Basin to the east. 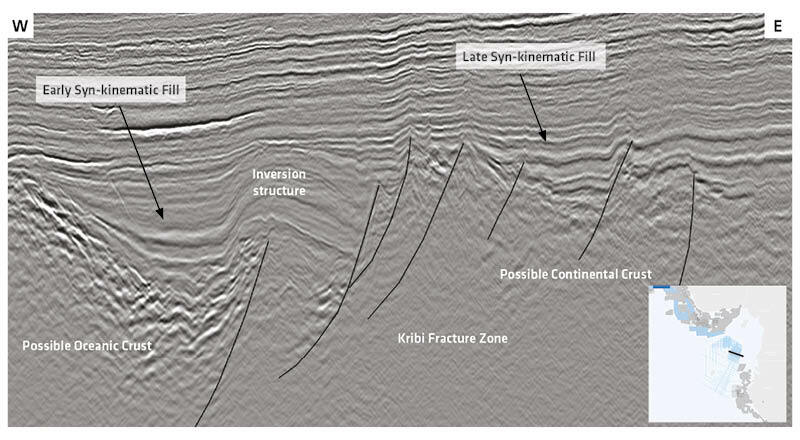 PSTM seismic section (below) from 2001 acquisition (reprocessed in 2014) showing tectonic zones, differing phases of syn-kinematic fill and evidence of sands draping over structural highs. In 1997, the STP-EEZ that extends 200 miles (321 km) from the coastline of the islands was ratified by the UN Convention on the Law of the Sea. This enabled Louisiana-based company ERHC, together with the South African company Procura Financial Consultants, to sign an exploration agreement resulting in the award of Blocks 4 and 11 in 2001. In September 1998, ExxonMobil and STPetro signed an agreement to technically assist with 22 recently drawn offshore blocks. The first activities under the agreement saw PGS acquire 2,723 line kilometres of 2D seismic data followed in 2001 and 2005 by the acquisition of a further 11,277 line kilometres of speculative 2D seismic data with associated gravity and magnetic data. A decade of exploration quiescence which resulted in little if any exploration activity. In 2012, Equator signed a PSC for Blocks 5 and 12 and later in the same year Oranto Petroleum agreed a PSC for Block 3 with a work commitment to acquire 1,500 km2 of 3D data (which has now been fulfilled). In 2013, Sinoangol, a joint venture between China and Angola’s state-owned oil companies, agreed to license Block 2 before farming-out to Sonangol. This is the most exciting period of exploration for the STP-EEZ, initiated by the award of Block 6 to Galp Energia in 2015, an agreement that included a 45% stake for Kosmos Energy, who earlier that year had farmed-in to Equator Explorations Block 12. Kosmos Energy then expanded its block licence footprint in 2017 by farming-in to Block 5, taking over the operatorship from Equator Exploration, followed a year later by their farm-in to Block 11, to take over all licence rights from ERHC. The latter agreement saw Kosmos partner with Galp Energia, with whom they already held a partnership in neighbouring Block 6. In 2018 Kosmos Energy completed its most recent activities by licensing, together with BP, Blocks 10 and 13 before the acquisition of extensive 3D seismic surveys with a focus over the eastern blocks. The PGS MultiClient data library over the region now includes the 2D survey acquired for ExxonMobil in 1999, together with the later 2D seismic, gravity and magnetic surveys acquired by PGS in 2001 and 2005. These three surveys have recently been reprocessed as a coherent dataset to allow seamless interpretation. In addition, the PGS MultiClient library contains the well data from Ubabudo-1 together with the eight exploration wells and one appraisal well drilled in the JDZ waters. The interpretation of these data along with industry feedback have indicated that there are four key reasons for the recent interest in the area. Historic geological interpretations predicted that the waters of the southern Gulf of Guinea, including the Niger Delta, were underpinned by oceanic crust. Revised crustal observations and models now suggest these areas instead contain a mélange of continental, transitional and oceanic crustal types controlled by extensional then compressional transform fracture zones. These revised crustal models have highlighted the potential for syn-kinematic sediments deposited in restricted marine conditions that can provide source rock deposits and accompanying structural plays. Source rock basin modelling results showing vitrinite reflectance, indicating source rock maturity. PGS have recently conducted a basin modelling study based on these revised continental and transitional crustal models. Temperature and source rock data from wells within the JDZ and offshore Gabon were also included. The study modelled three pseudowell locations in STP-EEZ to test the maturities of both the early post-kinematic sediments (Cenomanian-Turonian) and syn-kinematic source rocks. The results show that both potential source rocks are mature for oil and gas and are able to have charged the multiple sandstone reservoirs of the thick Cretaceous and Tertiary clastic successions. These results appear complementary to the presence of oil seeps onshore northern São Tomé at Uba Budo that have been typed to a Cretaceous source rock (ANP-STP). The Gulf of Guinea forms the sink for numerous fluvial systems: to the north lies the Niger Delta whilst to the northeast the Cross and Sanga River systems feed the Douala and Rio del Rey basins of Cameroon. To the south-east lies the Rio Muni Basin fed by the Mbini River of Equatorial Guinea and the Ogooué River of north Gabon. These rivers are believed to be long-lived, evident from Cretaceous sections interpreted on seismic data. The influence of these fluvial systems is witnessed by the preservation of unusually thick successions of distal fluvial outflow sediments with differing provenances and varying points of sediment input. An arbitrary line through Nigeria and the JDZ showing the sub-Akata Shale synkinematic structure and stratigraphy. The potential for a sub-Akata petroleum system has excited Niger Delta explorers and operators. The prolific plays of the Niger Delta are encountered in Tertiary siliciclastic reservoirs that are charged by the Eocene Akata Shale source rock. An exciting new play concept, which has captured the recent attention of operators and explorers, lies beneath the Akata sedimentary succession of the distal or outboard parts of the Niger Delta. Here, a thinned Tertiary succession lies atop continental or transitional crusts. 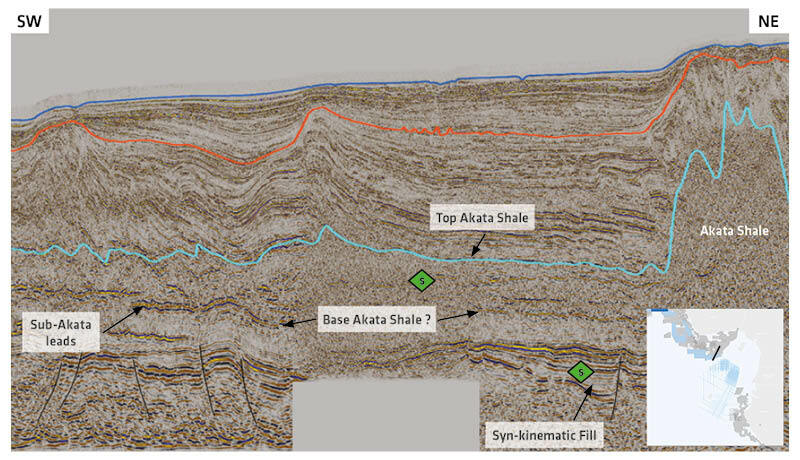 This play, as yet untested, predicts that the syn-kinematic source rocks are mature for oil and charge clastic reservoirs beneath the Akata Shale that acts as a seal rock. This new Niger Delta play is interpreted to continue southwards into the outboard Gulf of Guinea, including the STP-EEZ and the deep waters of Gabon. The surge in activity would appear to be a consequence of changes in geological understanding rather than for sociopolitical reasons. Modern processing of vintage seismic has provided compelling evidence that the crust beneath the STP-EEZ is a mėlange of continental, transitional and oceanic types influenced by transform tectonism. The overlying sedimentary wedges that fill the associated kinematic basins have the appearance of isolated basins. When these syn-kinematic sediments are applied to basin models, the results suggest that they are mature for oil and gas, results that are supported by the presence of hydrocarbon seeps onshore São Tomé Island. The post-kinematic stratigraphy is dominated by multiple long-lived fluvial systems that likely provide reservoir quality sand bodies that onlap and drape the transform structures providing structural and stratigraphic traps. All the elements of a working petroleum system appear to be present in the waters of the STP-EEZ. As exploration advances and wells are planned, it may only be a matter of time before we see the fruits that these new play concepts may bear. Use of palaeolandscapes is essential for understanding the South Atlantic, where the interplay of plate tectonics and landscape evolution has a direct influence on the development of hydrocarbons. While it is far too early to give accurate figures, the first deep water well in the Romanian part of the Black Sea looks to be a major success for operator and 50% shareholder ExxonMobil and its partner, Petrom, a member of the OMV Group.